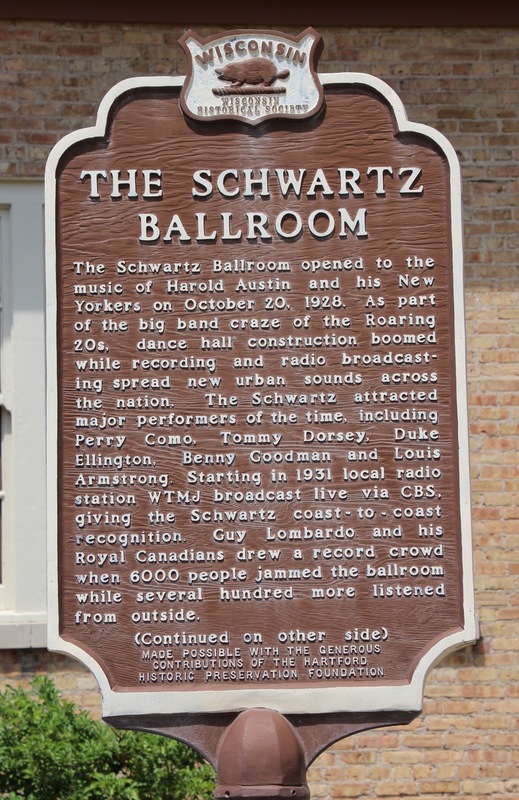 The Schwartz Ballroom opened to the music of Harold Austin and his New Yorkers on October 20, 1928. As part of the big band craze of the Roaring 20s, dance hall construction boomed while recording and radio broadcasting spread new urban sounds across the nation. 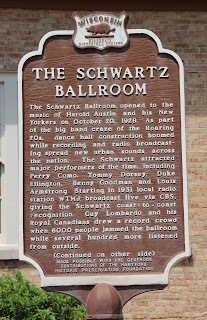 The Schwartz attracted major performers of the time, including Perry Como, Tommy Dorsey, Duke Ellington, Benny Goodman and Louis Armstrong. Starting in 1931 local radio station WTMJ broadcast live via CBS, giving the Schwartz coast–to-coast recognition. Guy Lombardo and his Royal Canadians drew a record crowd when 6000 people jammed the ballroom while several hundred more listened from outside. Designed by Milwaukee architect Robert A. Messmer and funded by local brewer Joseph Schwartz Jr., the ballroom features an octagonal “Great Hall” rising 36 feet at its center, the apex of which is adorned with an ornate one-ton wrought-iron Art Deco chandelier. The 112-foot unobstructed dance floor can accommodate 1500 dancing couples. 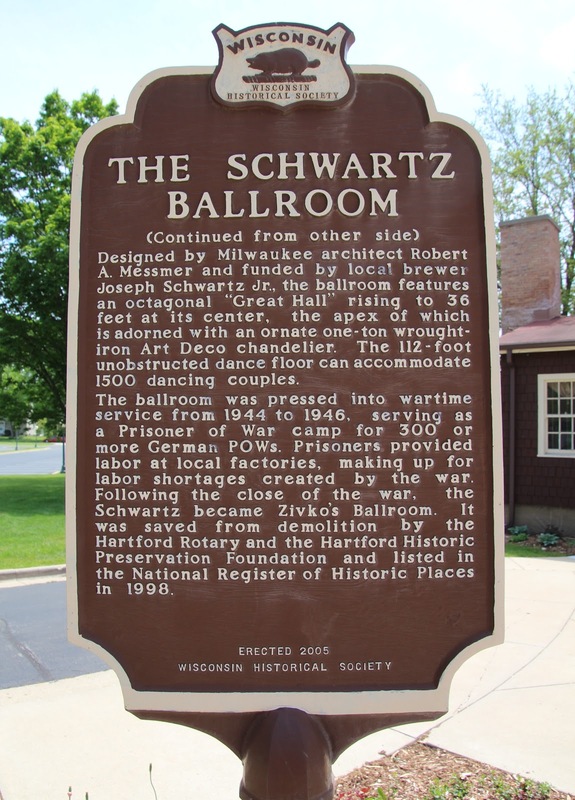 The ballroom was pressed in to wartime service from 1944 to 1946, serving as a Prisoner of War camp for 300 or more German POWs. Prisoners provided labor at local factories, making up for labor shortages created by the war. 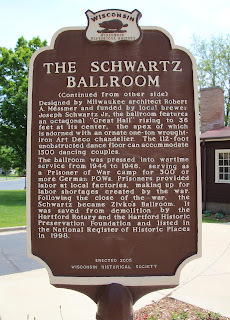 Following the close of the war, the Schwartz became Zivko’s Ballroom. It was saved from demolition by the Hartford Rotary and the Hartford Historic Preservation Foundation and listed in the National Register of Historic Places in 1998. The marker is located at the entrance to the Chandelier Ballroom, and is accessible from westbound Jefferson Avenue, between Grand Avenue / Wisconsin Highway 83 (to the east) and South Main Street (to the west), at or near 150 Jefferson Avenue, Hartford, Wisconsin 53027. 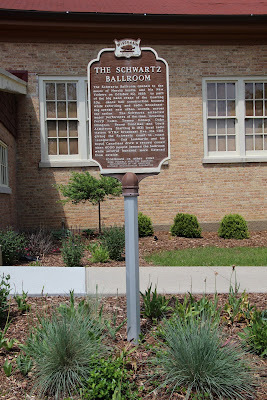 See also, Marker 575: Schwartz Family House, a related marker at a nearby location. end of a long driveway. is located in Hartford, Wisconsin.